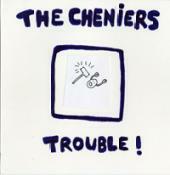 Dischord Records: The Cheniers - Trouble! Windian WIN20004 The Cheniers Trouble! The three-song debut single from Washington, D.C.'s The Cheniers. Stylistic nods to Pavement and The Fall. Artwork by David Berman of the Silver Jews. Released by Windian Records in 2010.